These Plays were in the FastModel Sports Basketball Plays and Drills Library. I hope you might be able to put one or two of the plays from today’s links to get an extra basket or two in some of your late season or post season games. The plays were contributed by Coach Matt Wheeler. The Boston Celtics start this play set up in a staggered screen with 1 & 5 screening for 2 at the free throw line. 2 curls around the first screen from 1 and cuts to the rim. 1 then turns around and cuts off of the screen from 5. 3 looks to pass to 2 at the rim, then 1 off of the screen. If those options aren’t available, 5 pops up top for a safety option. 4 stays in the corner for spacing. 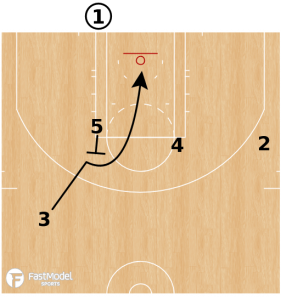 5 & 1 set a stagger screen for 2. 2 curls around the screen from 1 and cuts to the basket. 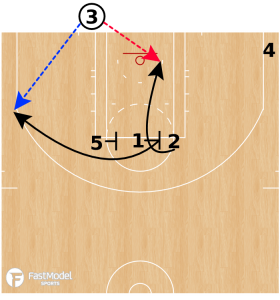 The Philadelphia 76ers used this BLOB play to get a dunk off the inbounds pass in their preseason game against the Boston Celtics. The 76ers were down 7 with under 2 minutes left and needed a quick basket. This play is designed so that x5 has to provide help on 2 consecutive screens. 5 slipped the second screen and was able to get a wide open dunk. 3 cuts off of the screen from 5 to the basket. 3 clears to the corner. 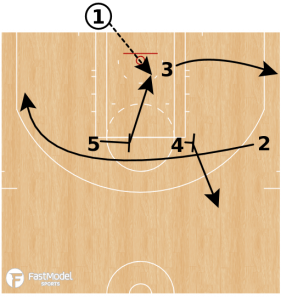 2 curls off the staggered screen from 4 & 5. 4 pops up top after the screen. 5 slips to the basket for a layup.